Afraid of adding a touch of the wild to your interior decor? Don’t be, says interior designer Daniella Norling of Auckland’s Trove Design: “Every room can take a little bit of animal.” “We can become afraid of animal and certainly if one overwhelms a room with it, a room can look a little très Betty Lynch,” Norling says. NZ House & Garden stylist Tracey Strange agrees: “Strong animal prints such as zebra or leopard, especially in black and white, can add glamour. But they are really easy to over-do. 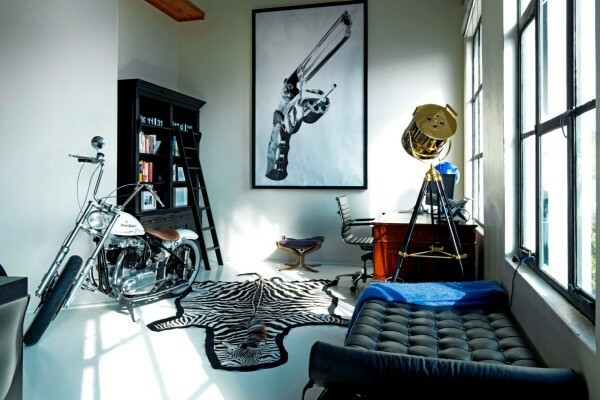 Best stick to one dramatic item – like a faux zebra skin or printed cow hide on the floor. Then you can mix it with bright colour such as hot pink and orange for a showy but still polished look,” she says. While some people can do animal well, and do it big, it can easily go very wrong, Strange warns. “If you really like the mix of print, hot colour and metallic, then make sure you have lots of neutral natural materials alongside – stone, leather and pale wood for example,” Strange suggests. THE BEDROOM – TRENDY OR TACKY? For those just starting with this style, begin with a small detail. “An easy way to give a room a lift is to change the cushion. As a rule of thumb, I’d use around three different textiles in my cushion collection. There’s no reason why you couldn’t put an animal print in with those,” Norling says. Tracey Strange loves seeing cow hide used in an unexpected way. “Mixing a hide with wood and other natural materials such as leather and stone just looks right. I also love seeing hides used slightly unexpectedly – like on the bed or as a covering for a coffee table. I have a small hide on the floor of my bathroom,” she says. If you want to add an animalistic touch, without going too real, a painting or a photograph can still bring the wild into the room. “If you feel that using actual animal skin is ethically wrong and don’t like faux, you can still bring an animal theme into the home with graphic animal images. There are heaps around – many of them wild and naturalistic,” Strange says.